Good evening LJ! Hello F_List! A wonderful, snowy, cold weekend to everyone. And a big, big Thank you to romeny and julchen11 for your wonderful christmas cards. Hugs you both! 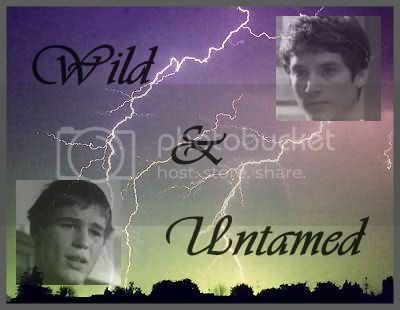 And now - finally - the next part of "Wild & Untamed". I'm too late - my muse didn't want to do right - but I hope, this breakdown is over now. I hope, you can still remember the last part - otherwise you can re-read it ;) Let's have fun with our boys! Casey sat just a few rows away from him on the bleachers and had unpacked his lunch his mom every day gave him for school. A small box with orange juice and an apple seemed to grab all his attention completely. Zeke snorted. A wimp, who allow everyone to push him around and never made even the attempt to stay up for himself! No one he wanted to deal with! But why couldn't he just forget this afternoon in the hut? Why did he miss the feeling of safety and nearness Casey had given to him for a few moments? Why did he still feel his soft lips when he had kissed him? It had been the storm! It always made him feel weak and helpless - and he hated it to be weak and helpless. No one should see him in this state. No one! Nevertheless, there had been the moments in the hut together with him. It was crazy to feel safe in the arms of Casey Connor. It was crazy to tell him his deepest secrets. But it had felt good and right in this moment. He had liked it, right? Zeke was not so sure about it. Casey was no one who defended himself. Casey always let everything happen to him. Everyone at school knew that Casey Connor was crushing for Deliah Profitt. The glances he dared at her couldn't be overlooked. And it was all to evident that Casey had no practical experiences. Probably this had been his first kiss ever. Zeke risked to second glance. How he closed his lips around the straw and sucked the last rest of orange juice out of the box. How his eyes seemed to be focused into nowhere and to see things no one else could see. How he ignored Zeke's presence. It was one week later. School was over and Casey still had the announcement of Miss Drake in the ears. She had told them, better to go home immediately after school because a storm was announced. Casey knew he should hurry up. Today he was not by bus than usual, because he had intended to go to the nearby sea to take a few pics after school. But now he had only one thought: Zeke! Casey sighed. It was not fair! An idea crossed his mind. Without hesitating any longer, he got on his bike and followed the road, the GTO had driven down only a few moments before. He had been right. In the moment he had seen Casey's look resting on him, he had known it. Casey Connor wanted to take care of him. Again! Pictures crossed his mind. The last storm. The hut. Casey was putting his arm around his shoulder, listened to him, tried to be there for him. Stupid - but somehow cute! The kiss. Stupid - but somehow hot! Something, he would like to do again. Just to find out how Casey felt about this little kiss. To find out if he dreamed about anything else. Of course, just for fun, okay? He grinned, rushed out of the parking lot and down the road. He passed Casey. When he arrived at the branch, he slammed on the brakes - maybe a bit to hard, but he had to make sure that Casey saw to him turning into the small side road. One look into the mirror and he was pleased: Casey had gotten onto his bike and followed him. Post more tonight, wake that muse up. PS--glad you got the card and knew who it was from. I didn't sign it Romeny, sorry. Kissing is always nice, isn't it? Go for it, Zeke ... Hugs you!